I try not to be too biographical here at the blog, but when I do, I try to be brief. I spent several years defending full-on pacifism. I believed that all violence (poorly defined) is evil, that self-defense is never justified, and that it was pragmatism (married to the state - what Yoder called "Constantinianism") which prompted the modern church, by and large, to teach that self-defense can ever be justified. I believed that the Sermon on the Mount (as well as Paul's words in Romans 12) was a sort of stumbling block which the church has refused to take seriously for centuries. I also refused to accept any distinction between the man as an individual and the man acting in behalf of the state. In recent years, I abandoned these views. I want to list (and briefly describe) the unresolved tensions which I believed I would be able to, but was never actually able to overcome. God commanded violence. Plain and simple. Whatever a pacifist believes, they must have some way of understanding and coping with this fact. How does God's commands in the OT coalesce with peaceful Jesus meek and mild that so many see in the NT? Throughout the Old Testament, God commands violence - whether it be the cleansing of Caanan or simply enforcement of civil and ceremonial laws by the use of the sword. In fact, God often punished men such as Saul who left any alive. When I held to pacifism, I believed that a solution to this problem would involve some sort of dichotomy between the church before Christ and the church after Christ. I theorized some sort of ethics by which it was right for God to command violence for the sake of the creation of the Israelite theocracy. This would establish a religious environment in which Christ could perfectly fulfill the law on behalf of his people and die as a sacrifice on their behalf. For years I believed I was on the right track, but there were serious problems. For starters, I was positing a time when God could command violence for the sake of a greater good. And yet this was the same ethical position which I was being so critical of. How could pragmatism be okay for God, and yet not for his people? In the end, I was driven to a divine command theory of ethics, whereby God's will is what is determinative of right and wrong. Thus, I argued that it must have been right for God to command violence before Christ, and the arrival of the Messiah heralded in a new age in which all violence now becomes wrong. Since God decides what is right and wrong, this did not seem to be a problem. Unfortunately (or you might say, fortunately), systematic problems arise given this theory, which I will touch on in the next point. This divine command position also had it's problems, and while I won't go into it, I became convinced that God determines right and wrong by his will, in accordance with His nature. Something cannot be wrong one day and right another. In other words, if violence is truly wrong, then it has always been wrong. I came to see that violence must be an outworking of God's justice, which is a love of Himself and His own glory. It was absurd for me to believe that violence is truly wrong in any and all situations without acknowledging a disconnect between the holiness of God and the holiness He expects from His people. I refused to disconnect the character of God from ethics, and that was one of the reasons why I abandoned pacifism. As an advocate of Reformed theology, I believed (and still believe) in penal substitutionary atonement. I was not (and am not) willing to give that up. The challenge I faced was formulating an understanding of the atonement which saw the violence perpetrated against Christ as being immediately bad and yet ultimately good because of the end which it accomplished. I believed that Christ died only to secure the salvation of "those believing," as John 3:16 says. Christ's intent in coming was not merely to remove violence from the world, but to take the sin upon himself and face the death which that sin required. If violence is always wrong, as pacifism posits, then how could any violence be of any ultimate good? Pacifists have seen this problem and actively encourage other pacifists to reject penal substitutionary atonement. There is a reason for this. One cannot have an acceptable view of the atonement without rejecting pacifism. One branch of our theology affects all the others. In order to be systematically consistent, pacifism must understand Christ as a victim and totally passive in his suffering. Reformed theology teaches that Christ was not only passively obedient to the Father, but that he was also actively obedient in his incarnation, life, and death. It is widely acknowledged that Christ could have ended his suffering with one word to the heavenly hosts. I saw it as impossible that Christ could have ended his sufferings at his own whim and yet that he was totally passive in his sufferings. Of course he was not. He willingly suffered and received the justice of his people upon himself. This was of his and the Father's design before the foundation of the world. I had no room in my system for Christ as absolute victim and absolute designer of the violence perpetrated upon Himself. Even if we understand the evil Christ suffered as being designed in God's providence (like all of the evil in the world), surely Christ's suffering was more than providential. The violence done to him was immediately evil but ultimately good. The second systematic problem arose from the discontinuity of the divine command position I discussed above. If something so fundamental to the preservation of the common kingdom as violence was right before Christ came, how could it now be bad? John Howard Yoder has discussed some solution to this. He says that the violence of the OT was done by God (it is His right as the Creator, I suppose) and that God did not demand that the Israelites kill their enemies, but rather that God would fight for them. That God would destroy their enemies, if only they would wait upon Him. In much of Yoder's OT exegesis, I think He is right. His book The Politics of Jesus points out that God did, in fact, fight for his people and that He promised to "go before them" into their battles. Many non-pacifists don't seem to notice this. However, this solution of Yoder's does not cover many of the violences in the OT. I point the reader, again, to Saul's refusal to kill every living thing and God's anger at this refusal. I would also point to God's command that various offenders of civil laws be executed. Pacifists largely argue that even punishing murder with execution is wrong and "unchristian." In the end, solving the pacifism problem created numerous systematic problems - the worst of which was a massive discontinuity between the Old and New Testament. I could not maintain my covenant theology and at the same time argue that something so major as violence has been completely done away with in the service of the common kingdom. These arguments all bleed together, somewhat. However, there were specific Biblical passages which I struggled to understand. Romans 13 is one example. In order to deal with the difficulties of Paul calling the state, who wields the sword, a "minister for good," I pointed out that Romans 13 is descriptive rather than prescriptive. The passage says that he is a minister for good, not that he ought to be one, and it says that he does it while wielding the sword, but does not say that it is good for him to wield the sword. I do not know how I was able to do such textual gymnastics for so many years. It is pathetic to think of. In summary, it is entirely impossible, as far as I'm concerned, to in the same sentence describe what someone does (which one knows to be evil) and then call that person doing this evil thing (in this case wielding the sword) a "minister for good." It makes no sense for Paul to point out something that he believes to be wrong and then to declare the one that does it "a minister for good." Another Biblical event which I was deeply troubled by was Jesus' cleansing of the temple. John 2:13-16 records Jesus doing several things which I found inconsistent with an absolute pacifist position. My best solution to incorporating these activities into my understanding Christ was to argue that this was not violence, properly defined. Surely Jesus did not actually touch anyone's body and cause them pain, I argued. Surely Jesus did not actually hurt anyone. And yet even if these arguments are perfectly accurate they disregard the real heart of what violence is. I remember reading various pacifists who claimed that violence really starts in the heart. It is about refusing to accept the world as God has made it and taking the bull by its horns, molding the world to our liking, even against the grain of the universe. If Christ was not doing this in his activities at the temple, then I don't know what violence would look like. It is self-evident that Jesus is attacking people, animals, and institutions - and doing it physically. A full-fledged pacifist has to either argue that Jesus did not use violence, or else argue that Jesus is allowed to do things that we are not allowed to do. And yet the example of Christ is a huge driving force in pacifist preaching. "Look to the example of Christ - follow the example of Christ... Be imitators of Christ's peacefulness and unwillingness to do violence..." The cleansing of the temple was a huge stumbling block for me - one that it might be argued I never found an answer to. Christians - especially, it seems, American Christians - seem a bit trigger-happy. I have buckets full of anecdotes from where I live and conversations I have with the many Christians around me who live here in Kansas. Many often will resort to violence, even when it is not a last resort. Glorification of guns and violence and harming one's neighbor are ubiquitous. One need only watch an hour or so of evening television to realize just what a passe thing violence has become. We take it for granted in the extreme. It is also not hard to see that we are becoming more and more desensitized to the violence around us. Christians, of all people, should know that justice is important, but that we ought to be quicker at dolling out grace in our interactions with everyone. We ought not to disregard Paul's words in Romans 12. We should not return evil for evil, but return evil with good, thus heaping burning coals upon our enemy's head. 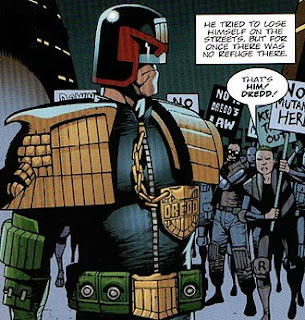 Absolute pacifism may not be a tenable position, but that doesn't mean that it is Christian to walk around like Judge Dredd, striking down evildoers wherever they stand. Violence is not to be celebrated by Christians, but lamented. After all, unlike marriage, violence didn't exist until after the fall. It is not "good" in the same sense that matrimony is "good." There is more to be said, but I'm also not promising any future installments. I just wanted to lay out in a simple fashion some of my reasons for rejecting pacifism. I've been having to give a lot of thought about that too. Thank you for laying it out as you have. On a side note, maybe it's just me but that first graphic looks an awful lot like Phil Johnson. 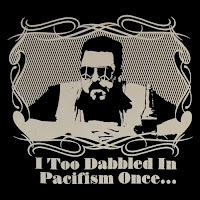 I never dabbled in pacifism. I was a Marine who became a Christian pacifist. You are right. There are many challenges. Some cannot be 'answered' but only left where they belong, in the providence of God. 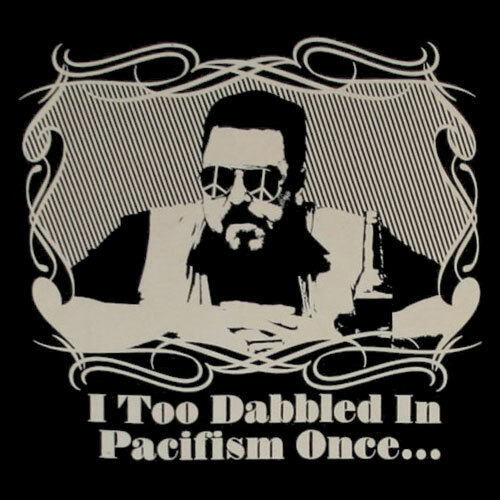 But the challenges for the non-pacifist Christian are just as great. God commanded violence. Plain and simple. Great answer to this on another site: Here’s the difference - that was God doing those things. They were demonstrably done under divine commandment and with divine approbation, unlike any similar violence since. We might argue that, since the incarnation of Christ, God simply wouldn’t support any such action. But regardless, there is no act of post-Biblical violence that can claim evident and revealed divine backing. If God wants to smite people, he can, because he knows perfectly that such action is justified. No human being has the right or the knowledge to make such a judgement. So until God comes down from heaven on a burning pie saying “kill the heathen”, Christians have no right to take it upon themselves to kill people. Mike, I defended this same form of argument for many years. If divine command theory of morality is appealing to you, then this argument may be a shelter for awhile. I also argued that only God has the right to take life, and so He may command it. This was where my reference to divine command theory above came from. I had to abandon this argument because I became persuaded that morality is rooted in the nature and not in the will of God. If morality is rooted in God's will, then violence is only wrong because God freely and arbitrarily (this is not meant to be a prejorative term) decided that violence is wrong. But as a pacifist, I argued that violence is 'against the grain of the universe' to borrow Hauerwas' term. If you use this form of argument, Mike, then you must believe that God decides what is right and wrong, not that he commands right and wrong in accord with His nature. For me, this is an untenable position. I appreciate your response, Mike. You're keeping it very civil and 'pacifist-like'. I've long been an advocate of personal self-defense and that of one's family, and as a subscriber to reformed theology have no problem reconciling that with my faith. I found the Westminster Larger Catechism's exposition of the sixth commandment to be helpful, especially when it talks about the duties required of individuals. In not killing others it follows that we are to preserve life. We fulfill this commandment by being peaceable, but also "by just defense thereof against violence". God's command to men is quoted in Psalm 82:4 "Deliver the poor and needy: rid them out of the hand of the wicked." This arguably can be done only through "just defense thereof against violence". See also Proverbs 24:11-12. "If thou forbear to deliver them that are drawn unto death, and those that are ready to be slain; If thou sayest, Behold, we knew it not; doth not he that pondereth the heart consider it? and he that keepeth thy soul, doth not he know it? and shall not he render to every man according to his works?" How then is one to fulfill this duty to protect the poor and needy if one does not take up arms in their defense? The key point is that the counterpart to "thou shalt not kill" is "thou shalt preserve life". Sometimes the only way to do that is to take up arms. This is not a license to violence or rashness, but to do what God commands.